This provocative and insightful film is the first in a series of documentaries that will reveal the secret knowledge embedded in the work of the greatest filmmaker of all time: Stanley Kubrick. This famed movie director who made films such as 2001: A Space Odyssey, A Clockwork Orange, The Shining and Eyes Wide Shut, placed symbols and hidden anecdotes into his films that tell a far different story than the films appeared to be saying. 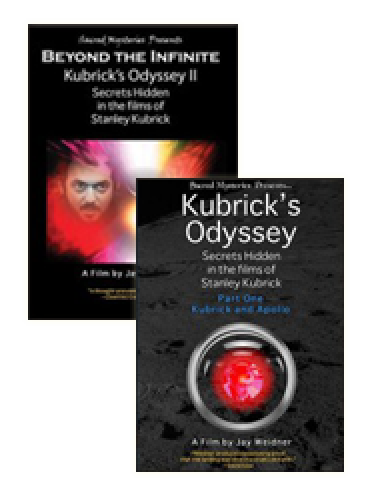 In Kubrick's Odyssey, Part I, Kubrick and Apollo, author and filmmaker, Jay Weidner presents compelling evidence of how Stanley Kubrick directed the Apollo moon landings. He reveals that the film, 2001: A Space Odyssey was not only a retelling of Arthur C. Clarke and Stanley Kubrick's novel, but also a research and development project that assisted Kubrick in the creation of the Apollo moon footage. In light of this revelation, Weidner also explores Kubrick's film, The Shining and shows that this film is, in actuality, the story of Kubrick's personal travails as he secretly worked on the Apollo footage for NASA. In this deeply provocative examination of Stanley Kubrick’s masterpiece 2001: A Space Odyssey, filmmaker and researcher Jay Weidner reveals that besides being a great science fiction movie, 2001 is also a multi-layered revelation concerning the human condition and our place in the universe. Weidner unveils new insights into this most mysterious of films and shows us that Kubrick was telling us another story underneath the story we are watching on the screen. In this secret story we can see that 2001: A Space Odyssey is a actually a work of alchemy; a film that initiates the viewer into a higher consciousness and opens the mind and heart to new vistas for the entire human race. 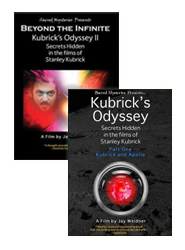 Kubrick uses powerful symbols in 2001 that were designed on purpose to reveal the secret of transformation and the path to our spiritual evolution. Discover the truth behind the blockbuster Hollywood classic and see why 2001: A Space Odyssey has captivated audiences since it’s release in 1968. Called by Wired Magazine an "authority on the hermetic and alchemical traditions," Jay Weidner is a renowned filmmaker, author and scholar. Considered to be a 'modern-day Indiana Jones' for his ongoing worldwide quests to find clues to mankind's spiritual destiny via ancient societies and artifacts, his body of work offers great insight into the circumstances that have led to the current global crisis. He is the director of the critically acclaimed feature documentary, Infinity: The Ultimate Trip, Journey Beyond Death , writer/director of the documentary series on the work of Stanley Kubrick, Kubrick's Odyssey and Beyond the Infinite , producer of the documentary films, 2012 The Odyssey , and its sequel Timewave 2013 . Jay was featured in the History Channel's documentary, The Lost Book of Nostradamus and was associate producer and featured in the History Channel's special, Nostradamus 2012 . He was also featured in the documentary, Room 237 , in Brad Meltzer's Decoded , and in Jesse Ventura's, Conspiracy Theory (TruTV). He is the co-author of The Mysteries of the Great Cross of Hendaye: Alchemy and the End of Time published by Destiny Books and A Monument to the End of Time (with Vincent Bridges). In 1991, Jay joined KCMU Public Radio in Seattle. He hosted the six-hour weekly interview program, Mind Over Matters , and was also the Public Affairs Director. In 1996, Jay became one of the first employees of a start up company called Gaiam, listed as one of the fastest growing corporations in the USA by Fortune Magazine. Jay was the Video Production Development Director at Gaiam until he departed in 2000. In 2000, he founded Sacred Mysteries together with his wife, Sharron Rose. He has directed thirteen films in the current Sacred Mysteries DVD Collection including Secrets of Alchemy, Artmind, Healing the Luminous Body, Quantum Astrology, Sophia Returning and more. As well as writing and directing the new feature film Shasta for Sacred Mysteries, Jay has returned to Gaiam Inc. to take over the duties of Director of Original Programming for Gaiam TV, a new on-line alternative television network. Jay is producing original shows with hosts George Noory of Coast-to-Coast AM, Regina Meredith and Lisa Garr. He is also producing Mindshift with Daniel Pinchbeck, Wisdom Teachings with David Wilcock, Secrets to Health with Mike Adams and Ed Group and much more. In 2014, Jay will begin production on his next feature film for Sacred Mysteries, The Controllers , to be released in 2015. Read the Review from The Red Dirt Reporter. "Weidner produces devastating proof that the landing was shot in a studio on Earth."